Analogy is either the cognitive process of transferring information from a particular subject (the analogue or source) to another particular subject (the target), or a linguistic expression corresponding to such a process. In a narrower sense, analogy is an inference or an argument from a particular to another particular, as opposed to deduction, induction, and abduction, where at least one of the premises or the conclusion is general. The word analogy can also refer to the relation between the source and the target themselves, which is often, though not necessarily, a similarity, as in the biological notion of analogy. A simple analogy explaining magnetic mirrors: a marble in a bowl. The highest the marble can reach as it rolls around in the bowlis the blue line. In mathematics and statistics, some types of analogies can have a precise mathematical formulation through the concept of isomorphism. Read More more details about this definition and another statistical terms at our new Basketball & Statistics Terminology Encyclopedia. is a Series of Notes edited regularly ! ! Take an inside look at a men's basketball practice with Head Coach Jamion Christian on the mic! Weekly Reflexions on Basketball Statistics: Who owns the basketball team statistical data? Who owns the basketball team statistical data? When the statistician ends his work and send the game analysis report: is the statistician owed a right to use the data for publication purposes ? First of all, at the early stages of the season, and in order to eliminate doubt from the beginning of the statistical employment, a document of agreement between the basketball team's manager and the statistician certainly would make clear and more comprehensible each party's respective obligatory preconditions and rights. If the agreement involves a total permission, we´ll have no any problems. Now, when the statistician works for a basketball team, data ownership clearly belongs to them. If it was agreed at the pre-season and contractually that the basketball team owns the data, and the statistician is partially allowed to use the data for publication purposes, obviously there is an obligation to hide the basketball team's and institution's identities to protect their rights to anonymity in accordance with this right of limited use. In any case, the head coach and the manager should be informed of such intended use of data and supplied with a copy of the final written research. is a Series of Notes edited the regularly ! Coach Becher has coached at the NCAA Division I, II, III and NAIA levels, as well as both men and women during his coaching career. He was one of the youngest NCAA head coaches in the nation when he took control of his first program at the age of 27 years old. Regardless of the school or level of play, his teams have consistently been among the nation's elite when it comes to rebounding, including 2014 when they set a national record for having a +19.9 rebound margin. In this video, Coach Bechler shares the philosophies and drills that have helped his teams achieve tremendous rebounding success. Learn how to develop an aggressive mentality in your players that have them constantly competing at their highest level. Coach Bechler teaches principles and tips for toughness that will improve your rebounding offensively, defensively and in the free throw lane. Go to Basketball Training Course to read the full review and watch the full live footage! How to Become a Better Shooter Off the Dribble by Mike Procopio! Mike Procopio: Become a Better Shooter Off the Dribble! Statistical Basketball- By STATS Director of Research Rebecca Goldin, Ph.D.
' Statistical Basketball- By STATS Director of Research Rebecca Goldin, Ph.D.
"... Big data might be finding all sorts of patterns, but for basketball fans, it’s a matter of what makes the ball go in the hoop. Systems developed to track missiles are now being used to track basketballs (and their players). ..."
"... While it is standard to keep track of a basketball player’s shooting average, everyone knows that circumstance plays a huge role. Big data can bring in conditional probability. What is the shooting average of Kevin Durant when his has a defender 3 feet away? ..."
"... The results are limited by a number of factors. The biggest is lack of data; without data on past performance, no future performance can be predicted. In this Image by Jennifer Fewell and Dieter Armbruster from Wired presented by eBA Stats Basketball Statistics Analysis . This why SportVU wants to increase its base – currently only 10 of the 30 MBA teams are inputting data. ..."
' Propuesta del test tiros libres con carga en el deporte de baloncesto ' by MSc. Juan Mapolón Arcendor. The legend of Miroslav Klose grew by leaps and bounds Wednesday. The Lazio striker used his hand to score a goal, then spectacularly convinced the referee to disallow it. The sport of soccer is better off because of it. Klose's heroics came in the pressure cooker that is Italy's Serie A. In the fifth minute of visiting Lazio's game against Napoli, Klose redirected a corner kick into the goal with his hand. In fact, he might have been trying to move his hand out of the way when the ball struck it. Napoli players protested furiously, while some Lazio players celebrated. What happened next will cement his good name around the world. In the mystical spirit of fair play, Klose spoke to the referee and convinced him to disallow the goal. It earned him the respect of players on both sides (as if he didn't already have it) and he was rightfully applauded by fans at Napoli's San Paulo Stadium. Klose, 34, has bagged so many goals for club and country, he probably didn't want any cheap ones on his resume. His glittering international career includes 64 goals for Germany, including the 14 he's scored at three FIFA World Cups -- good for second-most all time. The German marksman has also scored more than 185 goals for four clubs in two countries. Unfortunately, that would be the high point of Lazio's game, as Klose's team suffered a 3-0 drubbing. A1 is awarded a throw-in. While holding the ball, A1's hands crosses the plane of the boundary line so that the ball is above the in-bounds area. B2 catches the ball that is in A1's hands or taps the ball out of A1's hands. Before a thrower-in has released the ball on a throw-in, it is possible that the throwing-in motion could cause that player's hand(s) with the ball to break the plane of the boundary line separating the in-bounds area from the out-of-bounds area. In such situations, it continues to be the responsibility of the defending player to avoid interfering with the throw-in by contacting the ball while it is still in the hands of the thrower-in. B2 has interfered with the throw-in, thereby delaying the resuming of the game. A warning shall be given to B2 and communicated to coach B and this warning shall apply to all team B players for the remainder of the game. The repetition of a similar action by any team B player may result in a technical foul. In the described case in the question, no statistical registration is made, but if it was called a technical foul, a UNFORCED TURNOVER is charged against the offender player in the category "TF". One commentary about the rules to resume this topic: the defense may not break the plane of the line, if so they will receive a warning and then a technical foul. If the defense breaks the plane and touches the ball or the player BEFORE THE BALL IS RELEASED across the plane the penalty is a technical foul. When we analyze a basketball game we must have the video analysis help to decide the responsibility of each one of the player in this situation. "... Legal 3-pointer annulled: this is the 1998 NBA Finals Game Six - Chicago Bulls 87 Utah Jazz 86. Here you have two cases of shooting over the end of the 24 seconds: in the second case of the clip there is no problem of register. But in the first I have doubts: the basket was annulled but the replay shows that the shooting was legal: what's the register of this play ? We penalize the player with a missed field goal ? How the eBA Basketball Statistics Analysis System register this play ? ..."
Several drills demonstrated by Coach Eastman and players at Nike's Skills Academies for the nation's elite high school and college players. 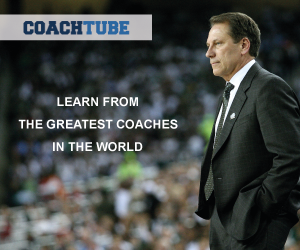 Check out ALL-BASKETBALL FEATURED MOST POPULAR COURSES! Check out all the'eBa sketball Training Courses & Videos' eBA COLLECTION! Basketball Beautiful Faces on MAY 2018 Cover from the EuroLeague 2018 ! With the CSKA DANCERS TEAM Waiting for the EuroLeague Final 4! wishes the eBA Stats Group from eBA-Stats.com ! With Aniyyah S., from the best... from the EuroLeague ! With the CSKA DANCERS TEAM ! Our Basketball Beautiful Faces of MAY 2018 Cover ! With Aniyyah S., a CSKA dancer performing during the last game ! !